The isotopes -- variants that have different numbers of neutrons -- are formed in the loose rocks and material that make up the regolith -- the surface layer down to solid rock. The chemistry begins when cosmic rays penetrate into the surface material. If the cosmic rays strike an atom of barium (Ba), the barium can lose one or more of its neutrons (n0). Atoms of xenon can pick up some of those neutrons â€“ a process called neutron capture â€“ to form the isotopes xenon-124 and xenon-126. In the same way, atoms of bromine (Br) can lose some of their neutrons to krypton, leading to the formation of krypton-80 and krypton-82 isotopes. These isotopes can enter the atmosphere when the regolith is disturbed by impacts and abrasion, allowing gas to escape. The Sample Analysis at Mars (SAM) laboratory suite inside NASA's Curiosity Mars rover has measured the isotope ratios of xenon and krypton in Mars' atmosphere. Development of SAM was coordinated by NASA's Goddard Space Flight Center, Greenbelt, Maryland. NASA's Jet Propulsion Laboratory, a division of Caltech in Pasadena, California, manages the Mars Science Laboratory Project, and built the project's Curiosity rover, for NASA's Science Mission Directorate, Washington. NASA's Curiosity rover has found evidence that chemistry in the surface material on Mars contributed dynamically to the makeup of its atmosphere over time. It's another clue that the history of the Red Planet's atmosphere is more complex and interesting than a simple legacy of loss. The findings come from the rover's Sample Analysis at Mars, or SAM, instrument suite, which studied the gases xenon and krypton in Mars' atmosphere. The two gases can be used as tracers to help scientists investigate the evolution and erosion of the Martian atmosphere. 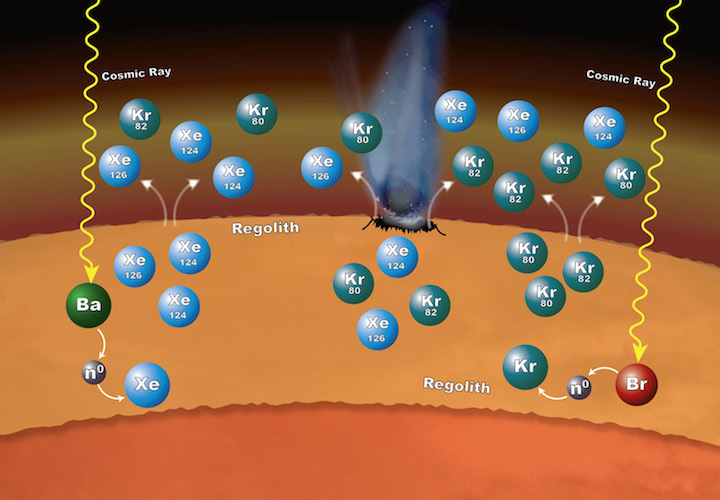 A lot of information about xenon and krypton in Mars' atmosphere came from analyses of Martian meteorites and measurements made by the Viking mission. "What we found is that earlier studies of xenon and krypton only told part of the story," said Pamela Conrad, lead author of the report and SAM's deputy principal investigator at NASA's Goddard Space Flight Center in Greenbelt, Maryland. "SAM is now giving us the first complete in situ benchmark against which to compare meteorite measurements." Of particular interest to scientists are the ratios of certain isotopes - or chemical variants - of xenon and krypton. The SAM team ran a series of first-of-a-kind experiments to measure all the isotopes of xenon and krypton in the Martian atmosphere. The experiments are described in a paper published in Earth and Planetary Science Letters. The team's method is called static mass spectrometry, and it's good for detecting gases or isotopes that are present only in trace amounts. Although static mass spectrometry isn't a new technique, its use on the surface of another planet is something only SAM has done. These isotopes could have been released into the atmosphere by impacts on the surface and by gas escaping from the regolith, which is the soil and broken rocks of the surface. "SAM's measurements provide evidence of a really interesting process in which the rock and unconsolidated material at the planet's surface have contributed to the xenon and krypton isotopic composition of the atmosphere in a dynamic way," said Conrad. "The unique capability to measure in situ the six and nine different isotopes of krypton and xenon allows scientists to delve into the complex interactions between the Martian atmosphere and crust," said Michael Meyer, lead scientist for the Mars Exploration Program at NASA Headquarters in Washington. "Discovering these interactions through time allows us to gain a greater understanding of planetary evolution."